Boronox – Hexagonal Boron Nitride coating. This paint like coating is water based and it is manufactured and exported by Supervac Industries, New Delhi. It comprises of ultra fine particles of boron nitride in aqueous base. The high chemical purity of BN particles along with an inorganic binder result in a very superior formulation which delivers a fluid and continuous coating with excellent adhesion to the surface. This water-based coating has excellent lubricating and releasing properties. It is also known as Boron Nitride Paint and Boron Nitride Lubricant. 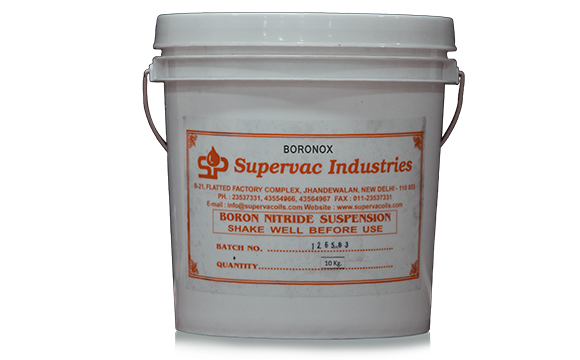 Why to Choose Supervac Industries? How to use Boron Nitride Coating? 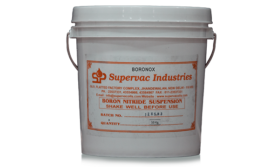 Boronox does not form a permanent coating on the substrate and can be removed whenever wanted. It comes in ready-to-use mode and needs to be just stirred before application. The area to be coated should be cleaned thoroughly and should be dry and free of oil, grease, dust, rust or any remnants of paint or lacquer. Depending upon the room temperature and the level of humidity, normally, a coat of Boronox will take about 10-15 Minutes to dry completely to touch. The coating can be applied with a conventional flat brush or roller. 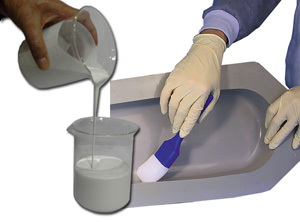 It desired by the user, Boronox can be thinned using distilled water. The waster should be added in small quantities and after each additional of water, the coating should be mixed slowly and thoroughly to avoid dumping. Boronox container should be covered thoroughly to avoid thickening of the coating since it is waster based and prone to drying.